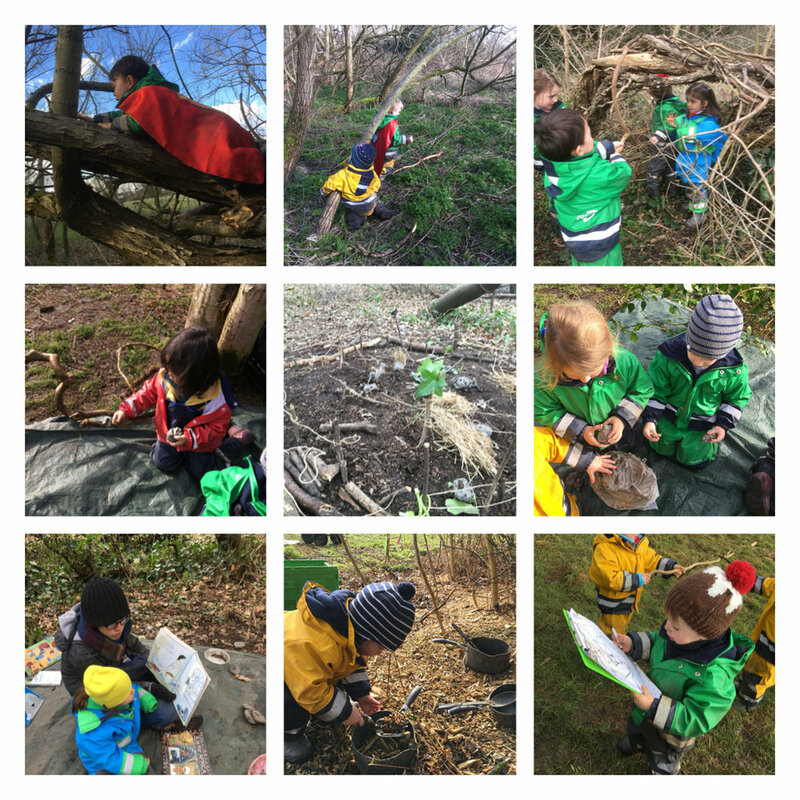 This week the children have enjoyed the relative warmth of the beginning of spring. It enabled the children to engage in some more focussed fine motor activities. On one day, the children decided they wanted to build a zoo. We provided them with string and clay so that they could start to create! Sylwia helped them to make animals by binding sticks, leaves and some clay together. They got very excited about this and came up with a wonderful array of animals to construct. Some made elephants, giraffes, tigers, and zebras whilst others came up with more unusual animals such as flamingos, cheetahs and anteaters! Another group set about making the fence for the animal enclosure. They weaved string between sticks set in the ground and even made mini trees for the animals to eat. The children also got involved in some wonderful mark making this week. They used pens and paper to do their own writing! In a small group, they decided to make their own laws of the forest! These included, “If there are baddies in the forest they have to leave!”, “You are not allowed to put rubbish in the forest”, “Don’t hurt the animals!” Once the list was compiled the children asked each other to sign the declaration on the page! Another wonderful activity spontaneously started up when a few children decided to make a mini zip-line using sticks and string. One child said, “We are making a prototype!”. They spent the whole morning testing their ideas and adjusting the length and height to find the optimum speed. Next week we are going to use their ideas to build a larger model that the children can actually ride! Next week is Stay and Play and we are really looking forward to welcoming families to the forest to get involved in the fun! Newer PostWimbledon - Face painting fun!